Black caviar promotes skin rejuvenation, as it contains a special set and a unique combination of large amounts of essential proteins, vitamins and minerals. The configuration of the cells of caviar is similar to the configuration of the cells of human skin and that boosts the rejuvenating effect. The best discovers are often happen by chance and caviar cosmetics is no exception. One of the most popular manufacturers of cosmetics based on black caviar is Madame Millet (Ingrid Millet), who was first to discover the healing properties of its plant cell extract and the first to use it in her products against premature aging of the skin. Once Madame Millet was walking along the coast and got interested in the work of women who were butchering fish and taking out black caviar. Observing this process, she noticed the surprising fact: the faces of workers were wrinkled and weather-beaten but their hands had young and perfectly smooth skin, as if they never done anything in their lifes but the embroidery. 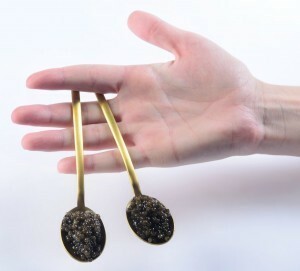 Madame Millett immediately decided to conduct the first worldwide scientific study of the properties of caviar in the Paris Institute of cosmetology. The results met all expectations – black caviar has just an amazing rejuvenating effect on the skin. Soon after, namely in 1964, a new line of cosmetics based on the black caviar extract appeared on the shelves. It was called Perle de Caviar and included cream, toner and facial masks. It turned out that black caviar contains a significant concentration of valuable biologically active substances: vitamins, lipids, proteins, styrenes and minerals that can give youth to the skin. Black caviar extract is a source of keratinocytes, fibroblasts, lymphocytes, vitamins: A (skin) (catalyst of biochemical reactions, a regulator of metabolism), E (antioxidant); trace elements: iron (synthesis of hemoglobin), magnesium (involved in neuromuscular transmission), copper (speeds up biochemical reactions); amino acids, mucopolysaccharides, glycoproteins, phospholipids. Black caviar makes your skin firm, elastic and velvety, strengthens tired skin and slows the aging process. The makeup on the skin after application of cosmetics based on black caviar is applied quickly and looks spectacular. How is it produced? How the black caviar goes in the jars and tubes of cream, gel or shampoo? These are the trade secrets of manufacturers who hold their commercial and technological secrets in a strict confidence. Each producer has its exclusive recipe. However, you have an opportunity to touch this magic and plunge into the world of exotic Spa treatments using these recipes of the homemade facial masks. Take a teaspoon of the black caviar and mix it with your daily nourishing cream, apply on face and keep for 15 – 20 minutes. Rinse with warm water. A few drops of olive oil combine with one teaspoon of the crushed black caviar, mix well and apply on face. Rinse after 20 minutes with warm water. If you have an oily skin type, substitute the oil with kefir or yoghurt. 1 raw egg yolk grind with 1 teaspoon of the black caviar. Add a bit of a white bread to make a consistency thicker. Apply on face and leave for 20 minutes. Rinse with room-temperature water.